I’ve been reading a little about DNA lately, particularly about how DNA testing can establish family lines and patterns of migration around the world. It has been fascinating, and it also raises some interesting questions and challenges about belief in God. 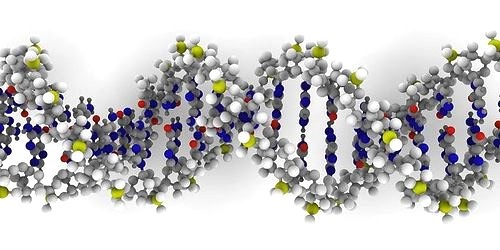 DNA is a complex molecule made of nucleotides. The key components are four nitrogen-based chemicals, known as ‘bases’, which act as a code which gives instructions when cells are dividing during reproduction or growth. The full DNA code has about 6 billion pieces of information. There is a full DNA code in the nucleus of every cell, in the form of 23 pairs of chromosomes, and different portions of the code are used to give instructions for the growth of different types of cells. The process of reproduction or cell division is amazingly complex, yet organised. A cell will be made up of a hundred or more proteins, each of which is made up of a chain of dozens, perhaps hundreds, of amino acids. Enzymes (one type of protein) read the information in a DNA molecule and copy it into messenger ribonucleic acid, or mRNA. The code carried by the mRNA is used to construct the sequence of amino acids in each protein molecule. Children inherit part of their DNA from each parent, and thus may have characteristics like hair colour, blood group or facial shape from either parent. However a small part of a cell’s DNA, known as mitochondrial DNA, is only inherited from the mother. Most of us are aware that DNA can be used to identify individuals, because every person’s DNA is different. But DNA can also be used to determine population movements and ancestry. Nuclear DNA is not very suitable for this purpose, because it can be inherited from each parent, and hence either grandparent, etc. Tracing any line is thus impossibly complex. But two special types of DNA are useful here. Mitochondrial DNA comes down to us only through the female line (i.e. fathers do not pass it on, although they receive it from their mothers) – thus each of us only have one line of maternal ancestors of our mitochondrial DNA. Mitochondrial DNA is normally passed down from parent to child accurately, but occasionally a mutation can occur. Comparison of a part of the sequence of mitochondrial DNA from different people will show either the same sequence, or some differences caused by mutations. The more mutations, the longer ago since they had a common maternal ancestor. Only men have a Y chromosome, so finding changes in the Y chromosome can give similar information for the paternal as mitochondrial DNA gives for the maternal line. The analysis of DNA reveals that, as far as we know, everyone alive today had a common maternal ancestor (often called ‘mitochondrial Eve’) who lived about 200,000 years ago, and a common paternal ancestor (often given the original name of ‘y-chromosomal Adam’) who lived sometime less that 100,000 years ago. Obviously these two were not a couple. Less obviously, they were not the only men or women alive at the time, it is just that the others have not passed down DNA via the maternal or paternal lines (though they would likely have passed DNA down a mixed line). These discoveries create challenges for christians and unbelievers alike. It appears there were three different species or sub species of ‘humans’ – homo erectus (about 1.8 million years to 300,000 years ago), Neanderthals (250,000 to 30,000 years ago) and home sapiens, which is us (from about 200,000 years ago). Were these all human? Did they all have a spiritual capacity (some would call this a soul)? It makes it difficult to see how Adam and Eve can fit into this picture. Some christians believe there was a first spiritually aware couple, others believe the story is a myth. These historical surmises raise questions about the doctrines of the fall and original sin. If we accept the first chapters of Genesis as a myth, the myth sounds more like the scientific conclusion of two single common ancestors leaving their place of birth to populate the earth than do most creation myths. The intricate process of reproduction involving a 1.5 gigabyte DNA code, construction of amino acids and complex proteins is amazing enough. To believe that it happened to form the first life without the DNA blueprint requires a lot of faith, especially as scientists haven’t been able to determine the mechanism and process yet. It looks like it was designed. DNA is effectively code which stores information, and the cells of the human body would be capable of storing 150 zettabytes (150 million million gigabytes) if all the DNA code was utilised to store different information. Some people argue that such information-bearing code requires a programmer – for example, former atheist Antony Flew gave this as one the main reasons why he decided God existed after all. I believe, overall, this information supports christianity more than it undermines it, but doubtless others will think differently. I have outlined the science, the historical conclusions, and the challenging questions in more detail at DNA, genes and human history. If you’re interested, check it out.